It is recognized that during these developmental years of the Labradoodle, not all Labradoodles will meet some of the criteria in this Breed Standard, especially in respect to coat type. It is therefore a guideline which breeders may breed towards as they pass through the generations to the ideal. Conformation is not designated for eye appeal, but as form to function. Correct conformation is necessary to preserve soundness in limbs and joints and overall physical health. The Labradoodle comes in three sizes, Standard (largest), Medium (somewhere between the Standard and Miniature size), and Miniature (smallest). There should be no appreciable difference in the general appearance in any of the three sizes. A compact dog, not exceptionally boxy nor long bodied. A galloping dog which gives the impression of light footed athleticism, and joyful bearing. Medium to light boning, graceful in movement and with vivacious expression. Coat should be non shedding, be of even length over body, on legs neck, tail and head, and should be as close to non allergenic as possible. Their unique traits of intuitive nature and the seeking of human eye contact should be easily discernible at a glance. Easily amenable to training. The Standard Labradoodle is over 20 inches at the highest point of the shoulders. The Miniature Labradoodle, "Mini" is below 17 inches to above 14 inches at the highest point of the shoulders. Confident, joyful, vivacious, clown like, sociable and friendly, totally non aggressive, clever and extremely intuitive. Well suited for special work such as Therapy Dog, Assistance Dog, Hearing or Seizure Alert Dog, Guide Dog. Can try to outsmart their owners just for fun, if not firmly disciplined when young. Respond well to positive training methods. Loyal and devoted to family. Most love water and are natural swimmers and retrievers. Affectionate and loving. Active and athletic when free, but should 'melt' into mellowness when touched by human hands. Disqualifying Faults Timidity, hyperactivity, aggressiveness to either people or other animals, are all serious disqualifying faults and dogs exhibiting these traits should not be bred from. First impression should be of a dog whose feet seem to hardly touch the ground. Light, lithe, graceful, athletic. When trotting, should have the appearance of 'going somewhere' with energy and effortless drive and purpose. Looking like they are dancing. When galloping, they should appear to float almost above the ground. Light and airy, flowing and free moving with a complete absence of apparent effort. Height to length ratio should be as ten is to twelve, being slightly longer in leg than deep in body, but still looking compact. Level topline, strong over loins and slightly sloping croup and with sloping shoulders flowing into firm elbows and front legs straight to the ground. Straight upright shoulders are a fault as are straight stifles. Stifles should have medium angulation and be long, with short strong hocks parallel and straight to the ground. Cow hocks are a fault as are toes turning either inwards or outwards. They are a galloping dog, so flanks should rise to a medium tuck up, from deep brisket and well sprung ribs. The head should be in proportion to the rest of the body, being neither blocky, nor too fine or chiseled. Medium stop, length from nose to eyes should be slightly longer than length from eyes to occiput. Skull should be slightly rounded but not domed. Forehead medium breadth, muzzle not snipey, but should have depth and breadth. Weak under jaw should be penalized. The head should flow naturally into a strong slightly curved and muscular neck and not appear to be 'stuck on.' Long narrow head is a fault. Should be wide apart and low set, below or level with the eyes and hanging flat against the sides of the head. The inner ear canal should not be too heavily coated. Ear 'leather' should be thinner rather than thick and spongy. Should be wide set, large and expressive, lustrous or sparkling, oval to round, and must not bulge (as in the Pekinese for example). Expression to be lively, curious, full of fun and intuitive looking, seeking human eye contact. Eye colors can be darkest brown, a transparent honey color, or shades of hazel. Wall or china eyes are not permissible. Protruding eyes, sunken or watery eyes are a fault. (note that puppies may sometimes have tear stained eyes during teething). Large square and fleshy in appearance. Must never be narrow or pointed. Brown colored dogs must have 'rose' or 'liver' colored noses and can never be black. Reds must have black noses. Other colors may have Any of the above, depending on the colors they themselves carry in their ancestry. Scissor bite, meaning that the upper teeth fit closely over the tops of the lower teeth. Gaps between upper and lower teeth are a fault. Undershot mouths (where the lower teeth extend beyond the upper teeth) are a fault. Overshot mouths (where the upper teeth extend beyond the lower teeth) are a fault. Crowded teeth in the adult dog are a fault especially in Miniatures. Ideally saber shaped as in the Labrador Retriever. But during the formative years of the breed the tail may be carried gaily and swirling over the back. Tightly curled teapot tails are not permissible. Kinked tails are not permissible. White tipped tails are not permissible. Tails must not be docked. Foot pads should be thick and deep and close together. Weak 'hare's feet' are a fault. There should be a definite 'ankle' between the feet and legs. Front dewclaws may be removed although it is not necessary. It is rare for a Labradoodle to have hind dewclaws but if puppies are born with them, they must be removed at four days old. Must be strong in all colors. Browns must have liver or rose pigment. Apricots and Reds must have black pigment. Missing pigment around the eyes, or spots or patches of white or pink on the nose, eye rims, lips or pads are not permissible. As the Labradoodle develops through the generations there are many coat types from short sparse hairy coats, to long flowing hair coats, to wooly curly coats. But the ideal is the non shedding Fleece or Curly Wool Coat, which must not shed, is allergy friendly to the vast majority of persons with dog related allergies and which has no doggy odor. The coat is one of the unique features of this breed and must be a priority coming close behind health & sound temperament. The Fleece coat: Fleece coats have a distinctly soft fleecy 'feel' like no other dog coat. It should be a single coat, with a complete absence of fluffy undercoat. Ideally it should not be too thick, nor fuzzy, but should hang in loose loopy spirals similar to that of the angora goat. Length is around four to six inches, on body, tail, head and face and on the legs. A 'change' of coat is permissible from puppy to adult and due to hormonal changes in entire females. This should not shed itself out, but needs to be stripped out with grooming. 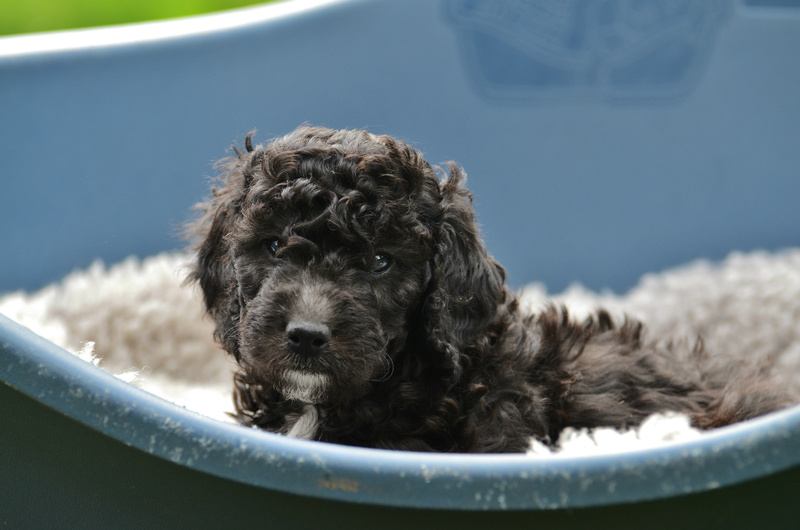 The Wool Curly Coat: The Wool Curly Coat feels similar to that of a pure bred Poodle and will often be quite tightly curled.But it should be the breeders' goal to breed a looser curl than that of the Poodle in the interest of lower maintenance. The Hair Coat: Hair Coats can be wavy or curly, short or long and although not ideal, are permissible during the early years of development in breeding programs. if these dogs are exceptional in conformation, temperament and health, they can be valuable breeding dogs when mated to suitable partners and should not be discarded for breeding. Solid: Coat color is solid and even. Clear colors are preferred but natural variations in the shading of the coat are not to be considered a fault. Note: The ILA will accept the registration of any other multi-colored Labradoodle provided DNA testing verifies the parentage. Hyperactivity, shyness, timidity, aggressive to people or other animals, snappy, yappy, high strung, missing pigment, overshot undershot or crowded mouths, patched color, Kinked or teapot tails, weak or 'hare' feet, heavy or ponderous build, cow hocks, dippy backs. In these early years of the development of the Labradoodle, It should be the goal of every serious breeder to do their best to safeguard the health status of the Labradoodle for future generations. Testing for hereditary unsoundness in breeding stock will go a long way towards this goal and although it is no guarantee of the health in their progeny, it should be accepted practice by every breeder to health test their dogs.